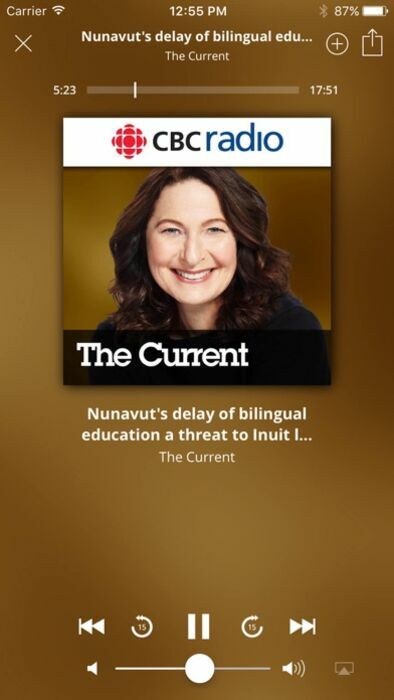 Listen to your favourite CBC (Canadian Broadcasting Corporation) Radio programs and podcasts on your iPad/iPhone/iPod Touch. Enjoy Radio One and Radio 2 live streams, as well as more than 80 of CBC Radio's most popular programs and podcasts on demand. 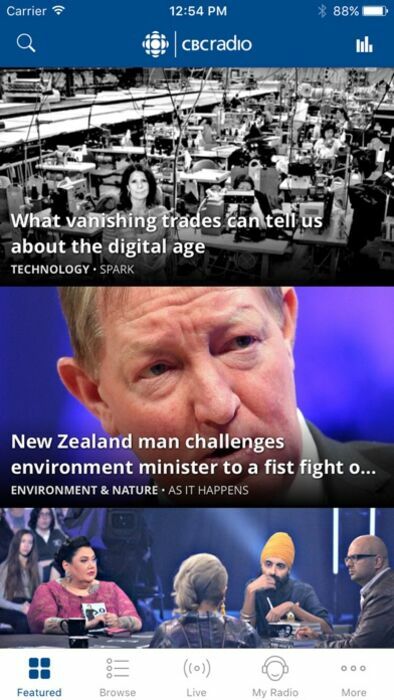 Listen to our featured stories, curated for you every day. 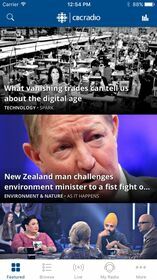 Browse through 12 categories, including News, Politics and Comedy. Check out archived episodes, save and download your audio for later listening. Build a playlist of your favourite clips and play them beginning to end. Sort by episode or segment. Find the local frequency for your favourite CBC Radio broadcast channel, and see what's playing on any CBC Radio network. The CBC Radio app allows for in-app search, which allows you to search for any CBC Radio One audio from 2013 to the present. You can also continue switching to a different device and pick up your listening where you left off. If you you like our app, please take a moment to rate us in the App Store. 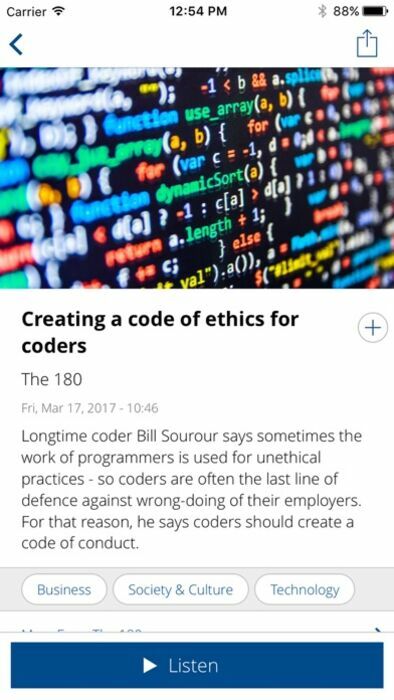 For bug reports or complaints, email audiencehelp@cbc.ca. We read and reply to every message. * Search all app audio for episodes and segments from any of our shows from 2013 to present. * The best in Canadian music, with 5 live streams inside Canada. * Listen to new audio stories curated for you every day. 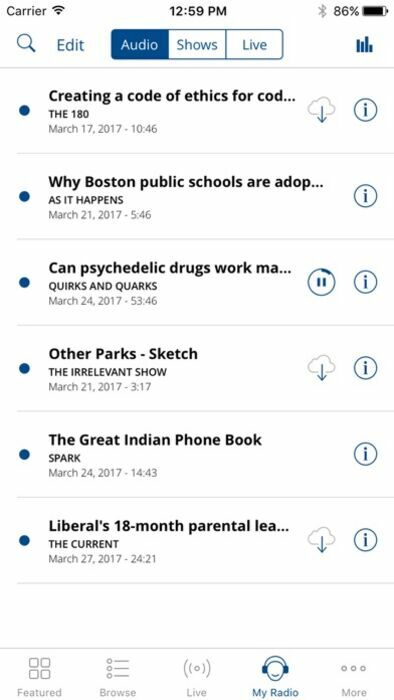 * Browse audio from 12 different subject categories, such as News, Comedy and Politics - or find audio from a particular CBC Radio show. Filter audio by full episode or segment. * Tune in to our talk network, Radio One, or listen to our music station, Radio 2. * You can now sort your saved or downloaded audio clips into any order you want, and play them from beginning to end in a playlist. Save your favourite shows, and sort them in any order you like, too. Save live streams for easy selection, and order them as you like in a list. Play your downloaded clips on the go, when you don't have a reliable network or WiFi connection. Swipe to delete clips from the playlist. 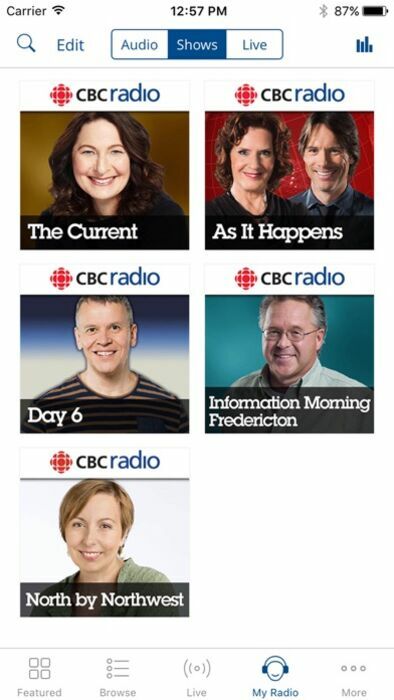 * Schedules allow you to plan your CBC Radio One and Radio 2 listening. Find the AM/FM frequencies for CBC Radio stations across the country. Select the Auto Play option, or Auto Select Quality to conserve data. Timers let you schedule the app to wake you up or turn off automatically. Watch tutorial walkthroughs to get the most out of the app. * Should you encounter issues or crashes, please feel free to email us at audiencehelp@cbc.ca.